The University of Science and Technology of China (USTC; simplified Chinese: 中国科学技术大学; traditional Chinese: 中國科學技術大學; pinyin: Zhōngguó Kēxué Jìshù Dàxué) is a national research university in Hefei, China. 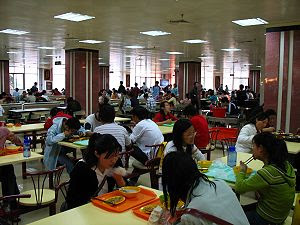 The university is regarded as one of the most prestigious universities in China. 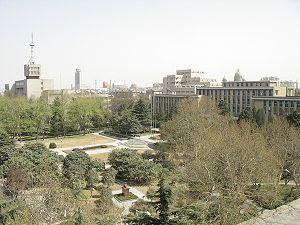 It was founded in Beijing by the Chinese Academy of Sciences(CAS) in September 1958. It was moved to Hefei city in Anhui province in the beginning of 1970 during the Cultural Revolution. USTC was founded by the Chinese Academy of Sciences (CAS) in 1958 in response to the urgent need for the national economy, defense construction, and education in science and technology. It has been featured by its competence on scientific and technological research and expended into humanities and management with a strong scientific and engineering emphasis. USTC has 9 schools, 23 departments, the Special Class for the Gifted Young, the Experimental Class for the Teaching Reform, the Graduate Schools (Hefei, Shanghai, Suzhou), School of Management (Beijing), the Software School, School of Network Education, and School of Continuing Education. USTC was founded in Beijing by the Chinese Academy of Sciences (CAS) in September 1958. Mr. Guo Moruo was the first president. The founding of the University is aimed at fostering high-level personnel of science and technology absolutely necessary for the development of the national economy, national defense construction, and education in science and technology. The establishment was hailed as "A Major Event in the History of Chinese Education and Science". CAS has supported USTC by combining most of its institutes with the departments of the university. USTC is listed in the top 16 national key universities, becoming the youngest national key university. In the beginning of 1970, USTC was moved to Hefei, the capital of Anhui province. Since 1978, USTC has initiated and implemented a series of open and reform measures with a forward-looking sense and innovative spirit. It recovered from the Cultural Revolution and achieved rapid development thereafter. USTC set up the first graduate school in China in 1978 to effectively cultivate its postgraduate students. 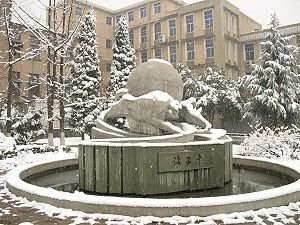 However, the main campus for graduate study in Beijing, where it was the first formal campus of USTC, was renamed Graduate School of the CAS later. Since the 1990s, USTC has taken the initiative of adapting to the necessity and challenge of the development of science and technology, education, and social economy. In 1995, USTC was approved by the central government as one of the first batch of universities obtaining the support of construction in the National 9th Five-year Plan and the "Project 211". In 1999, USTC was singled out as one of the 9 universities enjoying priority support from the nation's "Plan of Vitalizing Education Action Geared to the 21st Century". Since September 2002, USTC has been implementing its "Project 211" construction during the 10th National Development Plan. The USTCers have mandated the use of USTC in English or Keda[科大] rather than the full name University of Science and Technology of China due to honored tradition and the desire to avoid confusion with many similarly named institutions.